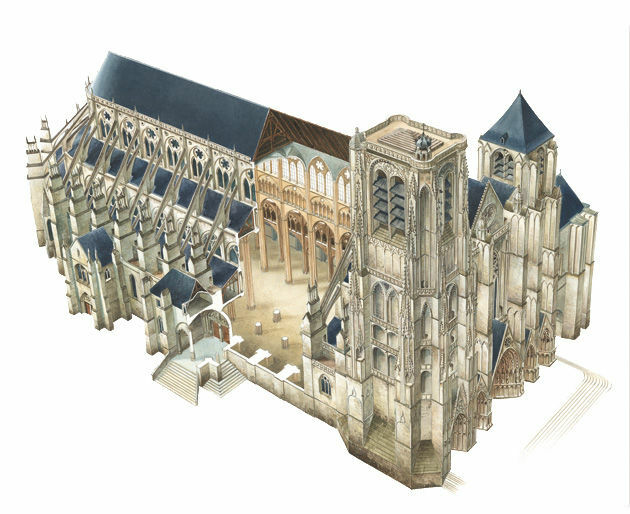 Find here all the information to prepare your visit of the Towers and crypt pf the cathedral de Bourges. Guided tour of the Gothic and Romanesque crypt in French (length 45 minutes), with access to the tower (self-guided). > Guided tours of the crypt and self-guided tours of the tower (396 steps) only. > Admission to the crypt gives access to the tower, or tickets can be purchased for the tower only. > Twin ticket including admission to the Palais Jacques Cœur. > For times, please contact us in advance. > Tower closed in case of bad weather (396 steps). > Appropriate attire is required to enter the cathedral. Tours for the Visually Impaired, visitors with Developmental or :earning disabilities or in French Sign Language by appointment.